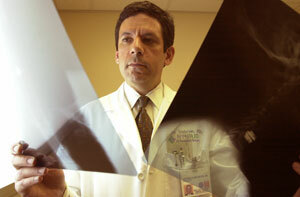 Dr. Goldstein treats most degenerative spine conditions which call for corrective surgery. Most spinal conditions calling for surgical correction are a result of the aging process. In previous times, these conditions were often highly debilitating and might cause a sufferer to be bed-ridden. Fortunately, we've made husg strides in treatment. Dr. Goldstein has been instrumental in the introduction of cervical artificial disc surgery for U.S. patients. Learn more about this new procedure here.